Once your system is installed, it is critical to maintain it. You have invested money in a sophisticated fire protection system and, in the event of fire, you should be confident that the system will work as designed. While some companies simply do a “walk through” and fill out your inspection paperwork, our team of trained inspectors understand this importance and take pride in ensuring that everything is functioning properly. In addition, we utilize a web-based compliance platform to ensure that our inspections are the most trusted in the industry. By bar coding each component you can be confident that each item has been inspected. Your final report is also guaranteed to be in compliance with NFPA, UL, OSHA and NIOSH. 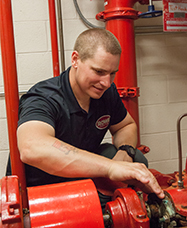 Fire sprinkler systems are an integral part of any building’s life safety system and must be maintained to function properly in the event of an emergency. Failure to inspect these systems can result in sprinkler malfunctions that damage property and disrupt your business. You made the investment to have a system installed. Why take the risk of catastrophic property damage or the loss of life by not maintaining the system properly? In addition, systems are typically installed based on insurance requirements or code requirements, which require periodic inspection. Contact Rowe and make sure one of our certified experts review your system and provide an estimate for a full inspection at no charge.